The Warded Man is a novel in the tradition of the epic fantasies of the 80’s and early 90’s. At the start of the novel Arlen is an eleven year old boy living in a remote village. He dreams of the wider world outside Tibbet’s Brook, of the famed Free Cities, and of becoming a Messenger, one of the hardy few who venture out into the unwarded wilderness and brave the coreling demons that come out at night and slaughter anything not safely protected by a warded a building or a warding circle. Arlen is not an orphan and there does not appear to be a prophecy suggesting that he may be one to save the world from a great evil. Except, there is a prophecy. The villages speak of “The Deliverer”, one who will come again and drive the corelings away and essentially save the world for humanity. Arlen is a farm boy, and we know that he is the hero of the novel, so there is reason to believe that if the prophecy is true, that he may be the one. In many ways The Warded Man skirts around the conventions of epic fantasy novels from ten to fifteen years ago. The prophecy is often dismissed by educated folk and few believe that any such redemption is possible. The demons that come out every night with the setting sun cannot be killed and they are a fact of life. The wards that protect the cities and towns are for defense only. The symbols for combat wards were lost thousands of years ago. All that is left is legend and “prophecy”, which may well just be a last bit of hope for humanity. The story of The Warded Man is told with three protagonists and takes place over more than a decade. Besides Arlen, there is Rojer and Leesha, both young apprentices. Rojer is a jonguleur in training, basically a minstrel, and Leesha is apprenticed to the Herb Gatherer, a village wise woman. They don’t know each other, but this is the sort of novel that suggests these three will form a motley traveling party at some point in the future. The core, no pun intended, of The Warded Man is a fairly standard and stock epic fantasy novel. Long time readers of David Eddings, Terry Brooks, Tad Williams, Raymond Feist, and Robert Jordan will be in very familiar territory. While this is not exactly a standard “quest fantasy”, the novel has that feel. In a sense, Arlen = Warrior, Rojer = Bard, Leesha = White Mage / Healer. On a basic level, there are standard roles in play here. This is only to say that Peter Brett’s debut novel has a familiar, slightly derivative feel from the start. Readers have been here before. What works, though, is Brett’s execution. The magic system of offensive and defensive wards is very well done and Brett doesn’t attempt to describe in detail the shape and appearance of each ward or give a grimoire of what each does (though, see The Great Bazaar for just that grimoire). Instead, Brett provides the rough edges of how the system works and the effects of the wards. Also, and this is very much to the benefit of the novel, this is a world that has lost much of its ward knowledge and there is no known central repository of ward-lore. This allows for a sense of discovery and it serves the story well. Readers looking for the minutiae of how everything works will be disappointed with The Warded Man, but everyone else will be satisfied with the level of description. 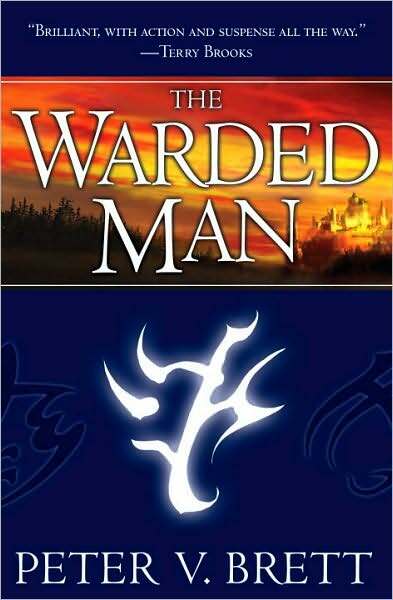 The Warded Man does not break new ground in the fantasy genre. It is very much in the tradition of what has come before and it should hold up well next to the epic of fantasy of the earlier part of the last two decades. The novel has a semi-slow start as readers sit through three separate character introductions, but the pacing picks up speed as Arlen, Rojer, and Leesha come closer to meeting up and the novel’s finale will likely thrill fans looking for a big fight. 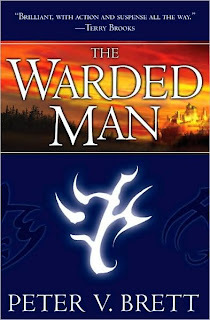 The Warded Man is a solid, though not outstanding, piece of epic fantasy. It is a worthy debut novel from Peter Brett and is good enough to have readers anticipate what happens next in The Desert Spear. "Solid, though not outstanding." I'm sure a solid read would be good enough for me. And the authors you compare Brett to aren't exactly small-time. I'll have to look this one up. It was more a comparison based on style, though had this been published in that same era, I think this would hold up well over the years. I'm almost done with the audiobook and I've been loving it. I'm definitely leaning more toward outstanding, but I see what you mean. I think I've been craving this kind of story for a while. Nebula Award Nominee: "Vinegar Peace"
Nebula and Hugo Award Nominee: "Act One"
Nebula Award Nominee: "Divining Light"